Once again we awoke early, and now it was on to getting things ready for leaving the Locanda Orseolo and embarking on the Ruby in the afternoon. After completing packing we enjoyed another beautiful breakfast. We then went to the hotel Europa for late Bloody Mary's.. We returned to the hotel where they had held our bags until our arrival to pick them up. 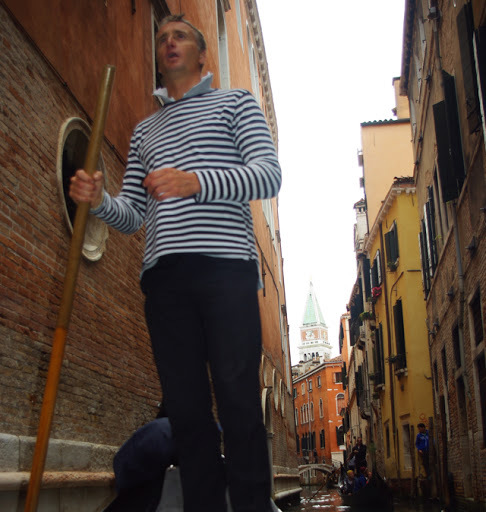 The water taxi arrived at the window and we bordered it through the window with our bags. What great fun! Almost like Harry Potter. Arrived on the Ruby at 1530 to begin our journey. We got back from our shopping, . our bags were still not at the cabin, so we went to get some liquid refreshment. Then on to dinner, every one was there, except John and Ilene, but and we still had a lively a conversation. When we got back to our room, late our bags were there, so it was on to unpacking, Ed was not feeling well, and we thought it was just fatigue, but it proved to be food poisoning! He was one sick puppy for the next couple of days. The next morning Ed was still not doing well, but he made a valiant effort to go on. 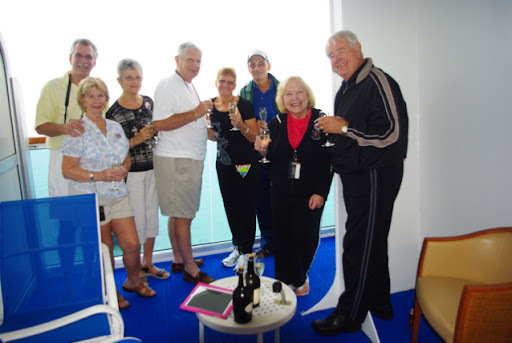 After breakfast, The group immediately decided to walk to the co-op to purchase wine for the cruise. Cindy enjoyed the trip since see had never experience the general market store. We invited everyone to our room for sail-away, as we are the only ones with a balcony. We have a nice size balcony, but the cabin steward Jirasin (J for short) opened the door for the service balcony next door, so we would have a lot more room. He is a great steward! Sea Venice we set alarm for 0700 and requested room service at 0730. Unfortunately they never came,, not sure what was going on. The morning events included the Cruise Critics group get to together (meet and greet) nice group over all, followed by the gift exchange. Not sure where the time goes, but very soon it was time to dress for formal night and time to round the group up for cocktails. As usual all the preparation paid off and all was in place for formal night. We had a good time, but Ed was sick, he left early, poor man. Naples, we set our alarm for 0600 and again requested room service for 0630. This time they showed up 0530 with half the order. Not good! 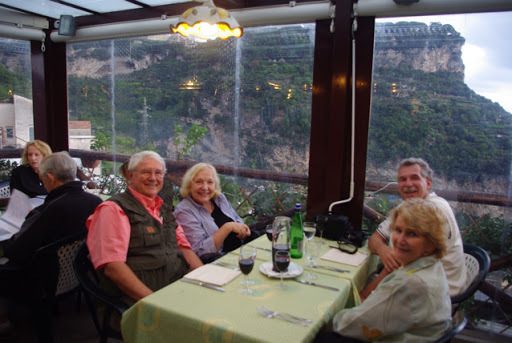 We met Val & Jim at the international coffee bar for an egg muffin and go ashore and begin our tour of the Amalfi coast and a visit of the Herculium ruins. The weather was not too cooperative as it rained as we preceded down the coast with Jim taking pictures through the rain drops. As we hit the bright spots the vistas showed their beauty and as we stopped at a village the rain would stop. What fun! We finally pasted Amalfi and joined the UNESCO heritage site road to the outer most villages where we had lunch at a family restaurant on the hillside. Our driver was telling us that his father's first job was leading donkeys along the old donkey trail to carry water back to his village, the travel time was three hours each way along the cliffs. The only village water was that brought in by his donkey group. After a great lunch with wine and water for 11.5 Euros each, we headed back for a guided tour of Herculium. The skies cleared and we even got a good shot at Mt Vesuvius. We returned to the ship onetime with Ed's pedometer reading 11572. And Ed was feeling human again, but I think he lost 10 lbs as all his clothes are loose now.